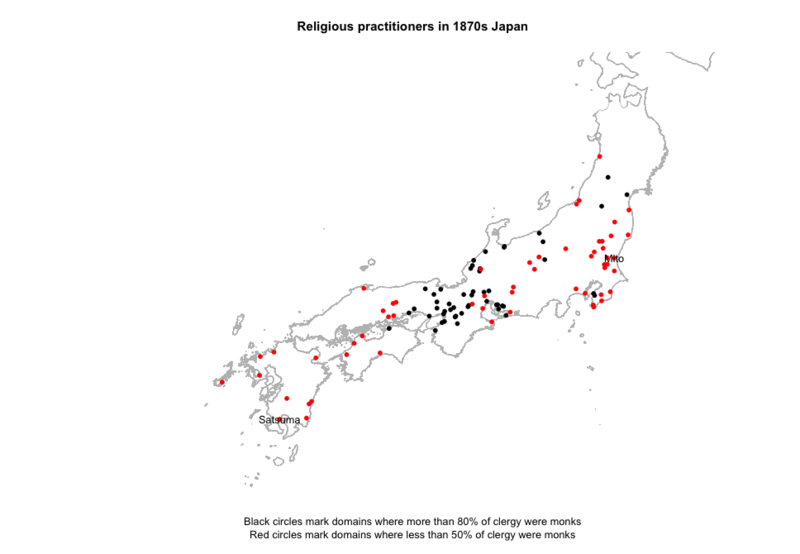 After reviewing a book on religion in 19th century Japan, I became curious about the quantitative dimension of religious practice, particularly the persecution of Buddhism. My initial visualizations turned into a exploration of how to visual spatial variation. The map below plots the extreme values for religious affiliation: domains with more 80% monks are marked as red, while less than 50% are marked in blue. Here again, we can see the same pattern – lot’s of monks around Kyoto and Nara, but fewer in Kyushu and the northeast. Two domains famous for their persecution of Buddhism, Mito and Kagoshima, are both in red, but so are nearby domains. What explains this regional trend in religious practice?